Amidst the rolling hills and the river Po, nestled within the forests, fields and meadows, the Saccoletto Daniele Winery sits patiently watching over their ten hectares of land spread between the towns of San Giorgio and Rosignano for over forty years. 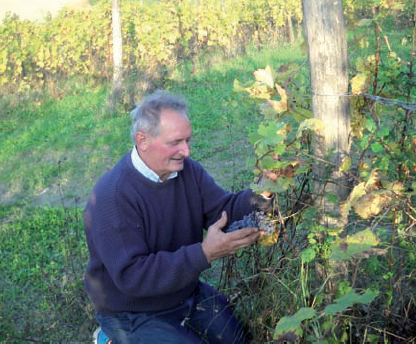 Here in eastern Piemonte they craft their wines with careful precision, always with pleasure but mostly with honesty as nature intends, completely organic. Each year brings something new because nature is not consistent and they are more than up to the challenge to adapt, constantly adding poetry from their hearts into the land and fruit. Being outside the DOC/DOCG system, their approaches often involve long maturation on the skins with natural yeasts, hand harvesting and titling their wines with creative names that harken to their family’s past. Certified Organic since 2000. Named for the nickname at the time their grandparents were making Prosecco and Verdino in a farm in Miane. The grapes are harvested in two rounds, spontaneous fermentation, remains on skins for 10 days and then pressed allowing fermentation to complete. Aged for 12 months in steel before spending 7-8 months in bottle.